Fish from cold water fish contains Omega-3 fatty acids. Country Life Omega-3 contains a total of 1000 mg of these oils, with 180 mg of EPA and 120 mg of DHA in only 1 softgel. 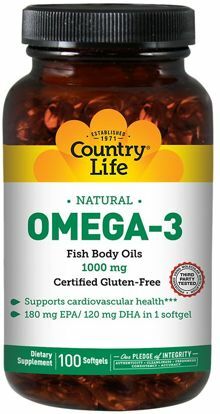 Consumption of omega 3 fatty acids supports cardiovascular health. As this product is derived from fish oil it is third party tested for heavy metals and toxins such as mercury and lead to ensure purity and safety.